8 Duets on Traditional Carols and Folk Songs. Edited by Jean Anne Shafferman. Duet or Duo; Solo Small Ensembles; Vocal Collection. Alfred's Vocal Duet Collection. Advent; Christmas; Epiphany; Folk; Sacred; Winter. Book. 72 pages. Jubilate Music Group #00-21517. Published by Jubilate Music Group (AP.21517). Christmas for Two continues the tradition of flexible, easily prepared vocal duets established by Carols for Two, Spirituals for Two, and Folk Songs for Two. 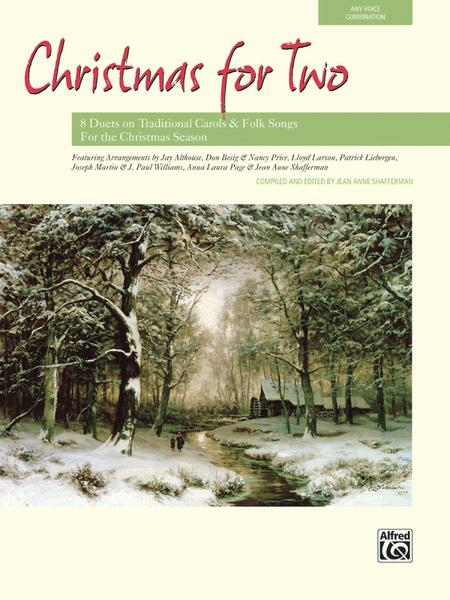 This collection features eight beloved carols, folk songs, and folk hymns, arranged for two equal voices. With lyrics for Advent, Christmas, and Epiphany, these duets are perfect for performance throughout the season, for both concerts and worship. Reproducible instrumental parts are included right in the book! An accompaniment CD recording and a book/CD kit are also available. Titles: Ding Dong! Merrily on High / He Is Born! (Page) * What Child Shall Come? (Liebergen) * The Virgin Mary Had a Baby Boy (Price, Besig) * Minuet Noel (Shafferman) * Come to Set Us Free (Shafferman, Larson) * English Advent Carol (Liebergen) * Hidden as a Baby (Williams, Martin) * Joyful, Joyful to the World (Althouse).